Working closely with our tannery for the past 20 years, Macatawa Bay Boat Works has precisely and authentically recreated factory colors in fine marine grade leather for Chris Craft, Gar Wood and Hackercraft boats. These colors are painstakingly recreated from original, well preserved samples. These leathers are of premium quality and are specially treated to preform exceptionally well in a marine environment. Other standard colors are available in fine marine grade leather in shades of blue, green, red, tan, brown or we can produce a custom color to match any color of your choice! We offer correct width and style leather "hidem" or "double welt" (shown here in Chris Craft Aquamarine) and made from the same hides you order for the upholstery cushions insuring a perfect match. Working closely with our tannery, Macatawa Bay Boat Works is able to offer the highest quality Marine Grade leather available. Our tannery has been making automotive, aircraft, marine and industrial leathers for well over a century, and currently supplies leather to many major auto manufacturers. Their marine-grade leather has an excellent surface quality which is resistant to abrasions, ultra-violet rays, bleeding and soiling. 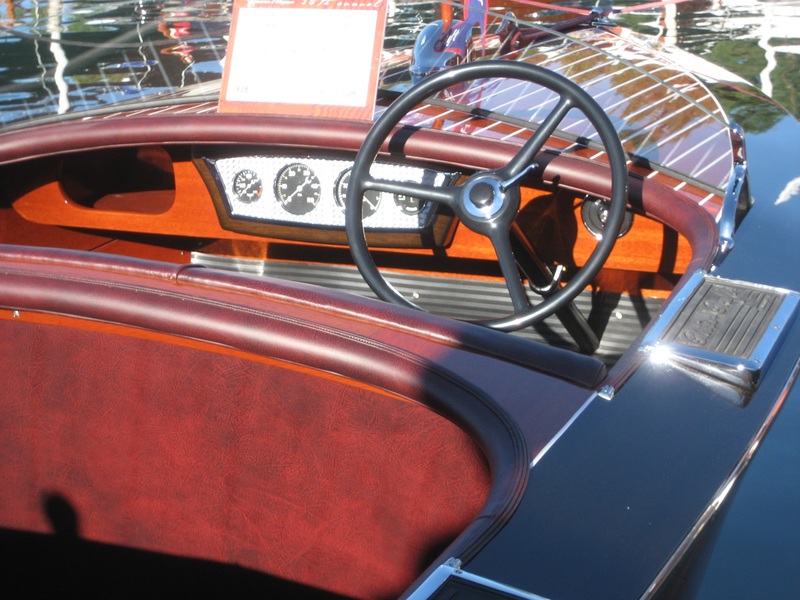 Macatawa Bay Boat Works is the exclusive distributor of this high-quality marine-grade leather, perfect for use in antique automotive restorations as well. 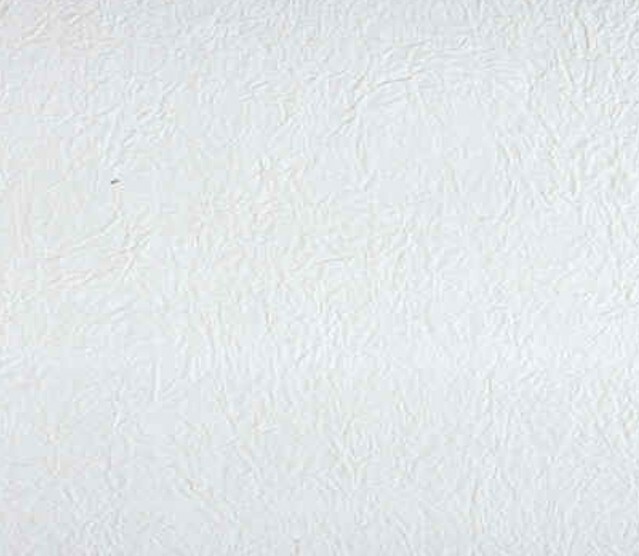 A unique, clear protective finish is impregnated into the surface of each hide; this finish is designed to make an excellent water barrier. New technology offers better waterproofing than old original marine leather. All MBBW leather is surface dyed. This protective finish serves as an abrasion or scuff-protective barrier. In the quality control laboratory, each run of marine-grade leather is tested on a rub simulator. The rub cams simulate 100,000 rubs; if the surface is broken, the entire run is returned to production for resurfacing and then is tested again. In the surfacing procedure, a generous amount of ultra-violet filter screen is added to the surfacing emulsion, and again a representative hide is taken to the lab and tested with direct simulated sunlight. This test is equivalent to 3 years of sunlight, 24 hours a day. MBBW hides are resistant to perspiration and many other agent spills such as soft drinks and lotions. Our hides are a generous 2.5-3.0 oz in thickness and above average in size. Thicker weights available special order. MBBW typically stocks most standard colors of leather and some of the authentic colors based on production run schedules. 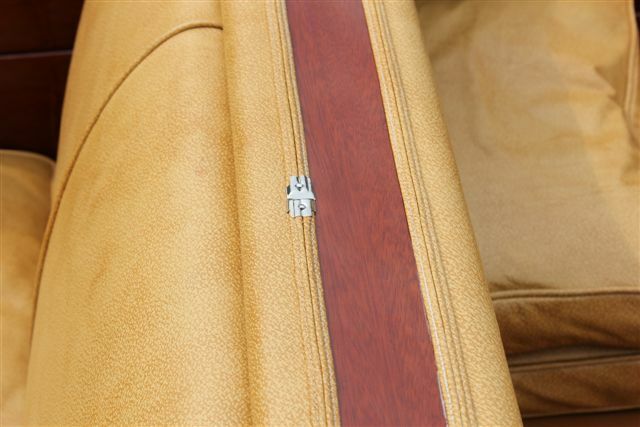 We can also duplicate any color leather, any grain, weight and finish. We can match an existing sample if provided to us. Custom leather orders require a pre-paid lab fee. Included in this is a partial hide proof for your approval prior to the full order. You may place as many orders of the custom leather after this one time lab fee is paid. There is a minimum of ten hides per order with a usual turnaround time of two months or less. Special orders require pre-payment.